Saw this challenge and decided to play. The only requirement was to make a one layer card with flowers. I can do that...and then Ardyth recommended that I post this in the CASology challenge as well. So I did. MOOD WHEN DONE = Happy to soak in the glorious spring weather (by keeping open the door while I'm up in the stamping cave). Fab design, Joan, and I adore the colors!!! So clever of you to use the back of the stamp to ground the sentiment. Thanks for playing along with One-Layer Simplicity! Thanks. I've been meaning to play the challenges for a while but the karma didn't come together until today. Ok, I'll check it out. Thanks! Fabulous one layer card. On my screen, it looks like you accented with a highlighter--a very cool effect. Great design work, as usual. Very sweet and happy. Love the colors - a great combination. Love these poppin' colors and the sweet and simple design. Oh, how I wish I could do a card like this and be happy with it. I accidently used the back of a large background stamp once. It was a real goof. I mean, how could I do that accidentally? Turned out somewhat okay, though. Your intentional use of the back of a stamp, on the other hand, is very clever. Joan, I'm so glad you did enter this at CASology...the fabulous colors and clean, one layer design are wonderful! 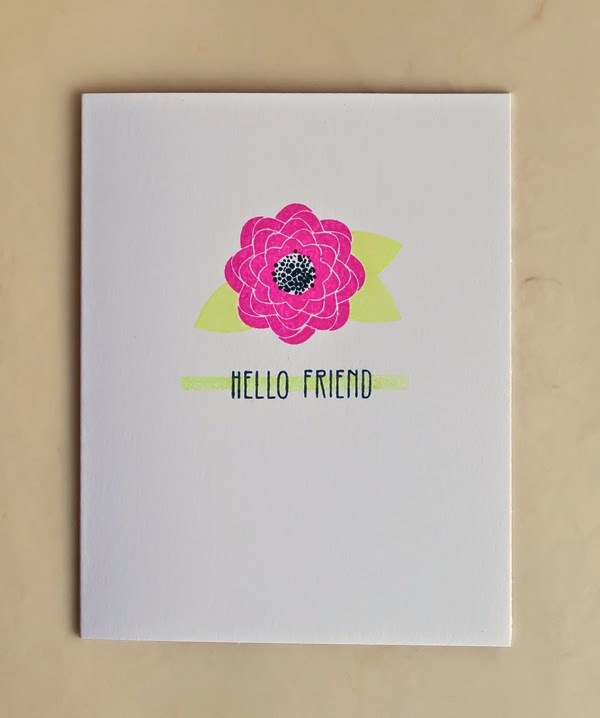 Love the bright colours on your sweet flower and the subtle swipe of green under the sentiment is perfect! Thanks for playing along with CASology this week!